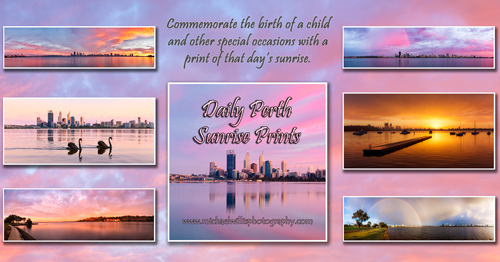 Daily Perth Sunrise Prints - The Perfect Way to Commemorate the Birth of a Child and a Wonderful Gift for Christenings, Weddings, Anniversaries and other Special Occasions. Photographs of every Perth sunrise throughout March 2014. After clicking on the thumbnails below, a new window will open showing the image at my pbase.com galleries. The perfect gift for a special occasion. A photographic print taken at sunrise makes a perfect gift to commemorate a special event that took place on the same day. As Perth’s skyline continues to evolve, a photograph captures a moment in time for posterity and in years to come will evoke memories of the special day while offering an intriguing look back at how the city once looked. With the sunrise’s symbolic links to the dawn of a new life, a sunrise print makes a wonderful present to commemorate the birth of a child and is the perfect gift for a Christening or naming ceremony. A print of one of my sunrise photographs can also be a suitable gift idea to commemorate and celebrate weddings, engagements, retirements, bar mitzvahs, graduations, milestone birthdays and many other special events. As the traditional first year wedding anniversary gift is paper, a print of the sunrise on the morning of the big day makes an ideal anniversary present to mark the first year of marriage. Unless otherwise stated, the images in these galleries are all open edition prints. In most cases, if the image shown on a particular day happens to be a limited edition print, a different open edition print may also be available. If you would like to see more images from particular date or are interested in purchasing a print, please fill out the contact form with your enquiry. Pricing for all of the unframed open edition prints in this gallery can be seen in the table at the bottom of the page. To view a stunning collection of landscape, cityscape and seascape photographs of Perth and Western Australia, please visit the main Open and Limited Edition Print gallery. Click here to purchase a Daily Perth Sunrise Print.